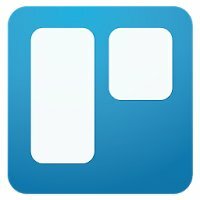 Free download Trello – Organize Anything v2.8.23 APK for android from revdl.comWhether you’re managing a team of freelancers, writing an epic screenplay, or just making a list of stuff to get done, Trello makes sure you’re organized and on top of it all.Like a whiteboard with super powers, Trello is simple to use and infinitely flexible. You’ll know exactly what needs to get done, who’s going to do it, and what’s coming up next. Plus, everything you do is synced and saved instantly to the cloud, so that all your devices are always up to date. With Trello, you can create boards to organize anything you’re working on. Use them solo, or invite colleagues, friends, and family to work together. With the Trello app in your pocket, you can make to-do lists waiting in line at the grocery store, assign tasks to your co-worker while you’re on the train home, or upload a photo of that paisley couch you saw the store that’s just perfect for the house you’re furnishing. Trello now supports Android Wear™ • Create cards directly from your watch by saying “take a note.” You can set a default board and list to which all cards are sent by default from your watch from the top right menu right after you log in.• Reply to comments without using your phone. Simply swipe left on any comment notification and tap reply.• Rich notifications for your watch.